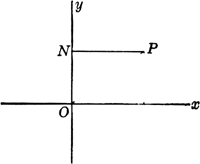 One of the coordinates of a two-dimensional coordinate system, usually the horizontal coordinate, denoted by x. In the plane Cartesian coordinate system, the horizontal coordinate of a point on a plane; the x-coordinate, obtained by measuring the distance from the point to the y-axis along a line parallel to the x-axis. The horizontal or x coordinate on an (x, y) graph; the input of a function against which the output is plotted. The vertical or y coordinate is the "ordinate". 6) without median tooth at apex; length relation between abscissae of radial vein of fore wing (Fig. 3](x, y) (defining L) and on the mesh refinement strategy it can be shown that, if the collocation abscissae can be chosen to avoid a singular matrix W, then ||[W.
By a generalization of the above expression for HBW, it can be shown that in a family of visual pigment spectra satisfying the aforementioned assumptions, any two spectra are related such that at equal ordinates, the abscissae vary in proportion to [v.
The abscissae show time which progresses from right to left (1 cm = 30 secs), while the ordinates indicate both temperature (1 cm = 25 [degrees] C) and power (1 cm = 200 kW).